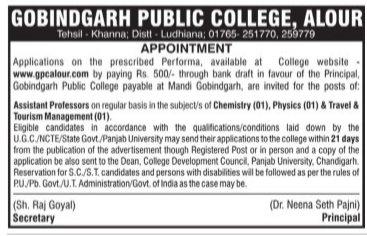 Gobindgarh Public College, Alour has advertised in the TRIBUNE newspaper for the recruitment of Teaching Faculty- Professor / Associate Professor / Assistant Professor Plus Non-Faculty jobs vacancies. Interested and eligible job aspirants are requested to apply within 21 days from 23rd January 2019. Check out further more details below. About College: Gobindgarh Public College is an Institute run for social welfare by Gobindgarh Educational & Social Welfare Trust is committed to EXCELLENCE in the Provision of value based education through various institutions. This commitment shall reflect in our comprehensive programmes, educational services to students, professionalism of Faculty and Staff and a regimented campus discipline. How to Apply: Interested and eligible candidates are requested to send their application along with CV, copies of certificates and recent PP size photo the following postal address through registered post or in person.